Call that file in a browser, and it should display the SERVER array including values for GEOIP_COUNTRY_CODE, GEOIP_COUNTRY_CODE3, and GEOIP_COUNTRY_NAME (make sure that you're calling the file from a public IP address, not a local one). 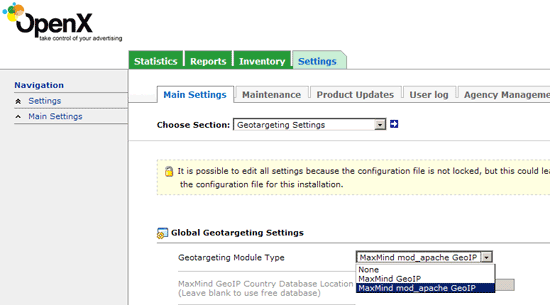 If you want to use lighttpd + mod_geoip for your OpenX ad server, make sure you select MaxMind mod_apache GeoIP under Settings > Main Settings > Geotargeting Settings. This will work for lighttod + mod_geoip as well.